Call the Professional Surveyors Today! Teunisen Surveying & Planning is New Jersey's, New York's and Pennsylvania's premier land surveying company. For over 40 years, Teunisen has developed quality processes, ensuring every survey is accurate and cost effective. Whether it's creating flood elevation certification and boundary surveys for homeowners, preparing topographical and construction surveys for construction companies, or reconstructing accidents scenes for victims, Teunisen has built a reputation as NJ's, PA's, and NY's TRUSTED provider. For almost half a century, companies and homeowners have turned to Teunisen for surveying. Teunisen's dedication to combining time tested surveying techniques with modern technology ensures each and every survey is of high-quality, delivered on-time, and cost effective. 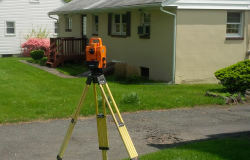 Thousands of NJ and PA businesses and home owners have used our trusted land surveying services. Teunisen surveyors use state of the art equipment and technology to provide high quality surveying for residential and commercial purposes. Give us call at 908-233-3550 or email for a free consultation. For over 40 years, Teunisen has been the construction industry's TRUSTED construction surveyor. 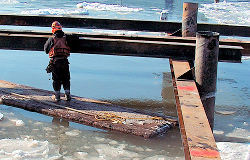 Also known for construction stakeout and construction staking, Teunisen has been staking out for roadways, bridges, buildings, and piers in NJ, NY, PA and the entire east coast. Our flexible lump sum contracts and contract splitting options can accommodate any project. As-built surveys record variations from original engineering plans or improvements to the land, and are often required by agencies to pinpoint the location of a structure at a point in time. If you need as-built drawings for floor plans, commercial and office buildings, lease separation agreements, Certificate of Occupancy (CO) or any other reason, contact Teunisen, the as-built surveyor, companies have trusted for almost half a century. ALTA/NSPS Land Title Surveys are survey standards from the American Land and Title Association (ALTA) and the National Society of Professional Surveyors (NSPS). Teunisen uses these strict sets of standards to create accurate and comprehensive land surveys. Teunisen uses flood elevation certification to document the elevation of a home or building. This document is extremely important for obtaining accurate flood insurance coverage or proving your structure is not in a flood zone. 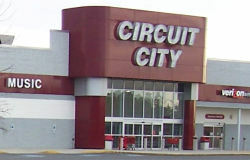 A boundary dispute, also called a property line dispute, may arise for many different reasons such as encroaching construction or dumping of debris. However, regardless of the situation, Teunisen has the experience and the expertise to help you protect your assets and maintain healthy relationships with your neighbors. Our structural monitoring systems can help prevent collapse, damage due to movement over time, and help you avoid costly litigation. Our surveying techniques can also acquire information about the stability of a structure before additions or expansions are made. 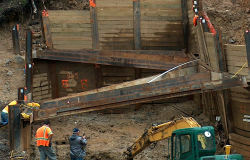 Teunisen has years of experience in accident reconstruction for all types of situations. After a car accident, truck accident, construction accident, domestic accident, or slip and fall, a Teunisen surveyor can arrive promptly at the scene of the accident and use our time-tested method for quality results. With over 40 years of experience in quality residential and commercial land surveying services, Teunisen Surveying & Planning is considered New Jersey's, New York's and Pennsylvania's top land surveying company. Our surveyors are familiar with all types of surveying, including ALTA/NSPS and structure monitoring surveys. By prioritizing both accuracy and innovation, Teunisen has developed both a quality method of surveying and a vast list of satisfied clients. To learn more about our services or to receive a free consultation with one of our surveying experts, give us call at 908-233-3550 or email us and put our 40 years of experience to work on your project. Teunisen has completed hundreds of successful surveys for homeowners and businesses, alike. Below are several of our commercial and public clients. If you would like to receive a full client list, please contact us. For over 40 years, Teunisen has built a reputation as the high quality, reliable surveyor. Give us a call today and put our proven surveying methods to work on your project.